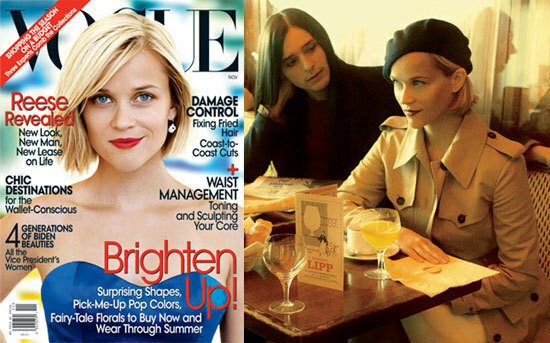 The lovely Reese Witherspoon graces the cover of November's Vogue. Along with a series of pictures taken by Mario Testino of the divorced-mother-of two in Paris was a long interview. Witherspoon is currently dating Jake Gyllenhaal. On Jake: "He's very supportive. Suffice it to say, I'm very happy in life, and I'm very lucky to have a lot of really supportive people around me who care very much for me, and, you know, that's all you can hope for in life. I am very blessed in that way." On traveling with her children: "I'm very lucky I get to bring my children to great places and they get to see the world with me, and we get to grow and learn and experience things together." On life: "Every once in a while you're hit with moments when you think, really? This is my life. How lucky am I? On making Four Christmases: "There are so many dynamics that people deal with all the time, and you don't really see it in movies very much. You don't see the blended-family Christmas very much. And it really is a complication in a lot of people's lives now. How do you see your mother and your father and not hurt anyone's feelings? You know, I didn't grow up like that. I mean, my parents are still married, and my grandparents stayed married, but it's a situation my own children will have to deal with, so it was of interest to me." On working with Vince Vaughn in Four Christmases:"Vince is the funniest person I've ever worked with in my entire life," she says. "There were days when we were shooting things, I would laugh so hard it would ruin the take, and I was afraid I was going to pee on myself, it was so funny." On playing a superhero in Monsters vs. Aliens: "I have a history, a long history of being stereotyped as a five-foot-two woman, which is very limiting. I've worked so hard to create characters that have dignity, and I think everybody knows that I have a very pro-woman message in my work -- and in my life."